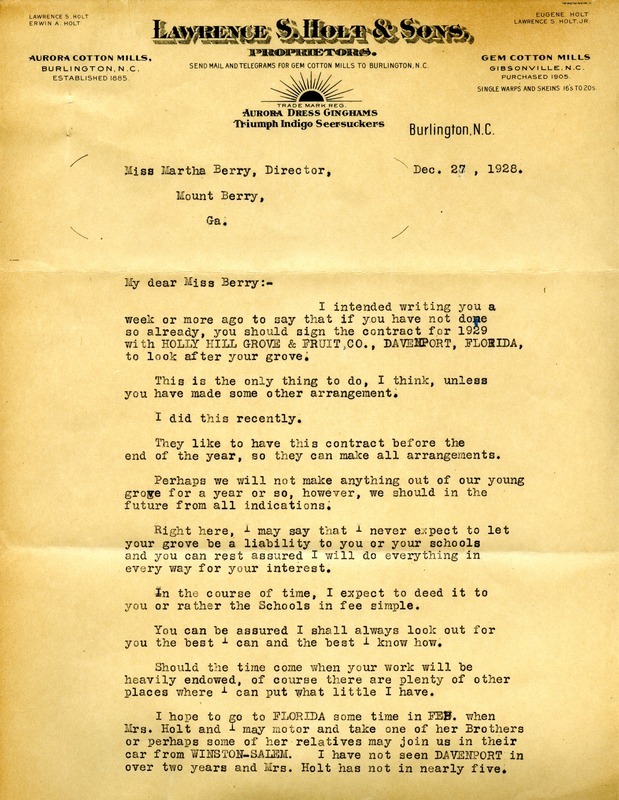 Mr. Holt suggests to Miss Berry that she should sign the contract with Holly Hill Grove & Fruit Co. of Davenport, Florida for 1929. 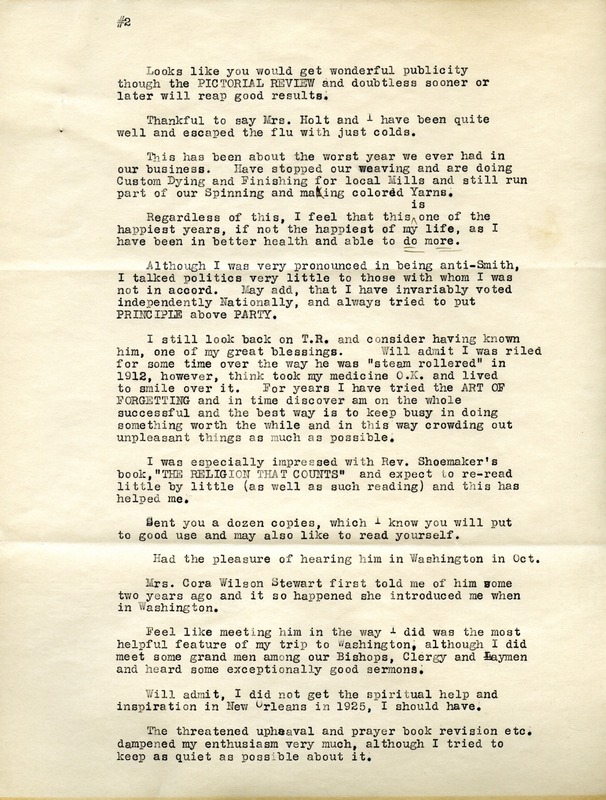 He also mentions the wonderful publicity Miss Berry would receive from the Pictorial Review, as well as the flu he and his wife managed to escape. He discusses, moreover, the terrible state of his business, but he feels as if the year was his happiest and his healthiest. He continues with his memories of Teddy Roosevelt and the election of 1912, where he hopes that the "art of forgetting" will come in handy. He also sends Miss Berry a dozen copies of Rev. Shoemaker's The Religion that Counts since he is worried that the Church is moving more towards Rome as it did in England. 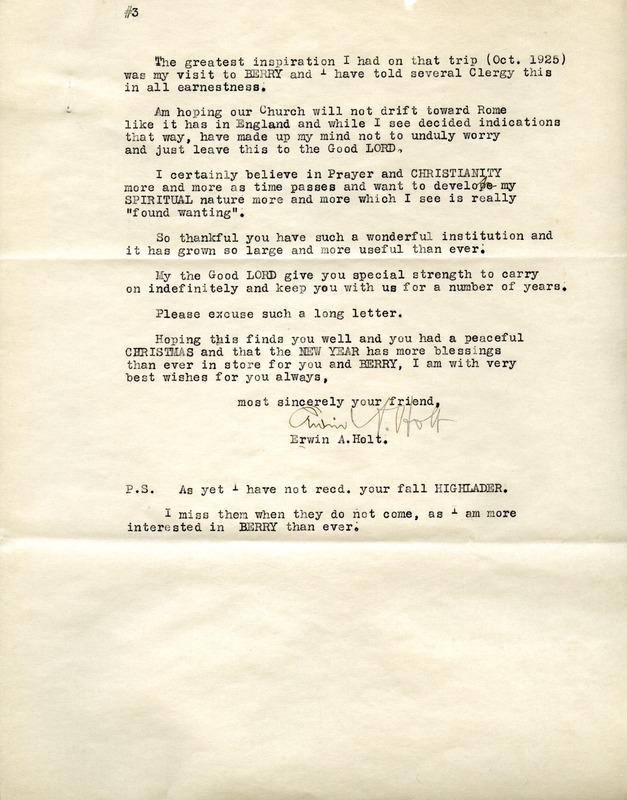 Edwin A. Holt, “Letter to Martha Berry from Erwin A. Holt.” Martha Berry Digital Archive. Eds. Schlitz, Stephanie A., Meg Ratliff, et al. Mount Berry: Berry College, 2012. accessed April 20, 2019, https://mbda.berry.edu/items/show/8222.